A completely surprising woman ! She is a professional and versatile artist determined, dynamical, we have met. Julie Land defends her projects with talent and ardour as much on scene as backstage. A vitality which makes her public overjoyed . An unanimous and grateful press ! But this profession is a real vocation ! Julie Land created many successful shows. Today, she works on beautiful songs of the past. To assume her profession and remain on the top, she respects a behaviour and an hygiene of exemplary life. And she is also a businesswoman ! Advice to the young people dreaming to follow this way, you’ll certainly need temperament ! Julie Land, first of all, thank you . Can you introduce yourself in some words? My name is Julie Land, a french name, very easy to remember in any other language. I was born in Paris, I was brought up in Montmorency in Ile de France. I am Taurus, Gemini ascendient. After secondary studies, I follow classes in the philological faculty in Sorbonne, and at the same time, I follow classes of theater and song. I learnt everything, of the music theory in the dramatic art, by way of the classes of expression. I , for a long time scrupulously prepared for the only profession which I always wanted to make. I begin my artistic career to the theater Fontaine in Paris with Poiret and Serrault and to the theater of Paris with Roger Pierre and Jean Marc Thibaut. I participate in the competition of the song " The golden rose of Antibes ". It opened me the big Cabarets and famous Casinos of France, tours abroad, the happiness to meet Francis Lopez and to play in some of his operettas, the enjoyment to know Pierrette Bruno and to interpret one of her creations. All these artistic experiences were only strengthening my motivation and my determination that is to say I made the good choice. I like singing the enjoyments, the sorrows, the misunderstandings of love. Tell us about your last show « The Time of Guinguettes ». It’s a show in 5 “ tableaus” that I conceived and that I interpret on a orchestral band. To present it, I shall say that, it is a tourbillonnante evocation, with a communicative cheerfulness, a joy of living and the happiness to hum these lovely tunes, that marked the history of the French song. « Enjoy yourselves ! Needs to laugh ! It’s good for the moral ! » That is, what I would say to people, to give them the joy to come to see my show, and for one hour and a half , to make a cure of Health, Cheerfulness, Joy of life and Happiness. What are the shows you created ? 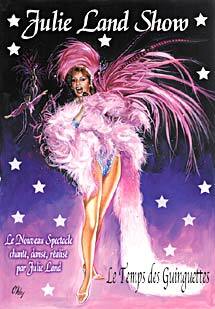 I created the " Julie Land Show " in the famous Parisian cabaret, the “Don Camilo”, compound and wrote by Francis Lopez and Pascal Sevran whom we see regularly on the television, in the broadcast that he presents. I created to the theater “Hébertot” my Show "Julie la Joie" I was accompanied by the orchestra of Christian Cravero. I took this show back in the “Menagerie of the Cirque d’Hiver”, and the originality was to make the public dance after the show. I kept a very good “souvenir” of it . 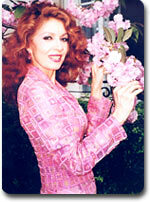 I created for very renowned hotel " La Villa d' Este " on the lake of Côme in Italy, the review "Julie Paris 2000". Today, my show « The Time of Guinguettes » seems to please, entertainers, turners, by the consequences that I can have it. It is true that all these tunes are in the air today , and the public who comes , asks for more of it. Who writes and composes your songs? For my songs, I worked with Michel Jourdan, Didier Barbelivien, Jean Sala, Francis Lopez, Pascal Sevran and many others. You force yourself every day in a very big sports discipline but also in an hygiene of exemplary life, can you tell us more about it ? Yes, I have an hygiene of life and one certain discipline indeed. Every morning, at 7 am, I am in the swimming pool and I swim for 1 hour, immediately after, I make 1 hour 30 of intense jogging, and that’s where I work my shows, by earing and rehearsing songs in ears. I have a very healthy food, which allows me to satisfy my hunger, without setting of weight, (I eat once a day, at 12). I sleep minimum 8 hours even often more. I do not scatter in the insignificances and keep my energy for the main part. Olympia has only to open me its arms, I shall snuggle up there with delight . What structure, this day, manages your representations? You represent the French Show abroad. Except hexagon, what are the demands of your performances ? By my show, I make known or rediscover, this magnificent jewel, that is our cultural patrimony of the French song. And I have to say that foreign countries are very interested to present it in their homeland. I have many demands (I speak and I sing in English, Spanish and Italian) . I have perspectives for Belgium, Switzerland, Morocco, Italy ..
What could you advise a young lady who wishes to follow your road ? My advice : Health of over; motivation; determination; and especially the soul deep in the body. Which works (or dvd and k7), do you advise her to read to coach her better ? For me, nothing is worth the experience on the ground. It is also very useful to see all kinds of shows, because we learn a lot by seeing the others. I leave to sing with my dancers to the casino of “ Montrond les Bains” and then I go, I hope, bring heat and happiness to people of the North of France.